Bellandur Kere Habba! It sounded like a distant dream; when, all we hear about our beloved bedridden lake is only froth, fumes, smell and fires. And we dared to dream the impossible. Finally, on August 5, we were on ground zero next to the lake, celebrating the lake which was first loved, then abused and now struggling to be alive. Should we have waited to see the lake completely rejuvenated or was it right to celebrate small steps? Not sure, but all of us, who put together hard work over three weeks, were very happy to see our dream come true with celebration of lake rejuvenation efforts and associated events supporting the cause. 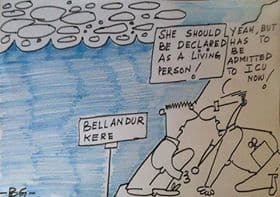 Bellandur lake is struggling to find the saviour in the tussle among various government departments. The Bengaluru Development Authority (BDA) is the owner, Bruhat Bengaluru Mahanagara Palike (BBMP) is supposed to safeguard it from dumping, Bengaluru Water Supply and Sewerage Board (BWSSB) is supposed to protect it from 40% of city sewage entering it, Karnataka State Pollution Control Board (KSPCB) who is supposed to monitor its life, Karnataka Lake Conservation and Development Authority (KLCDA) is the custodian. Then, we, the citizens living around it, watching it getting torturous every single day, who felt its pain and the need to save it. Ram Prasad, from Friends of Lakes, mentioned during panel discussion that lakes are nature’s gift and belong to commons. Unless there is realisation about this close coupling of water bodies and human life, no measures undertaken will bear any fruit. We need to understand water in our tap is coming from a source that needs to be kept alive and clean. Dr. Vasanthi Amar, JC, Mahadevapura zone BBMP mentioned that till the time people used to go to water bodies to fetch water, they had a close connection. Now water comes to homes in taps and we have forgotten and neglected the sources of water. 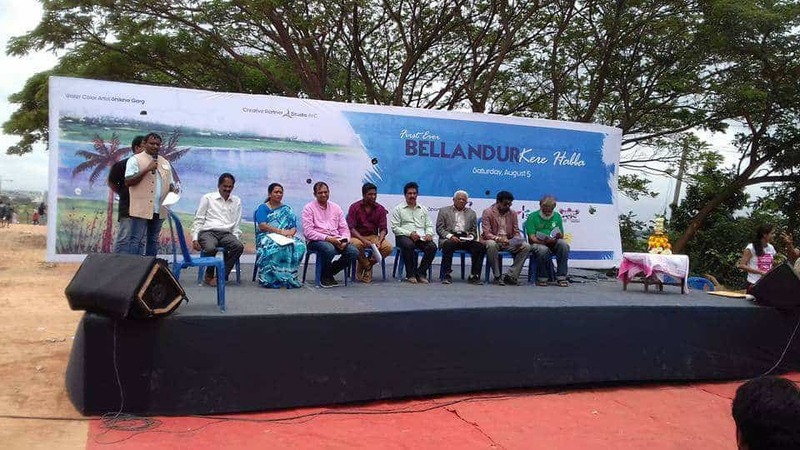 2017 has heralded “Save Bellandur” lake efforts after the instances of two fires and excessive foam in the lake and subsequent National Green Tribunal (NGT) order rapping civic authorities to take necessary steps to clean and rejuvenate the lake. We, the members of Bellandur lake citizen committee, are engaged in monitoring the progress of work that was promised and pushed by NGT order and recommended by Lake expert committee. When we met BDA officials, they told us about all proposals and tenders that have been floated to rejuvenate the lake. We wanted to see it on ground. Surprisingly, officials were equally keen to showcase the work done so far, to citizens to give assurance of what’s being done. Things started falling in place and August 5 became the historical day to have first-ever Bellandur Kere Habba. We had three weeks’ notice. 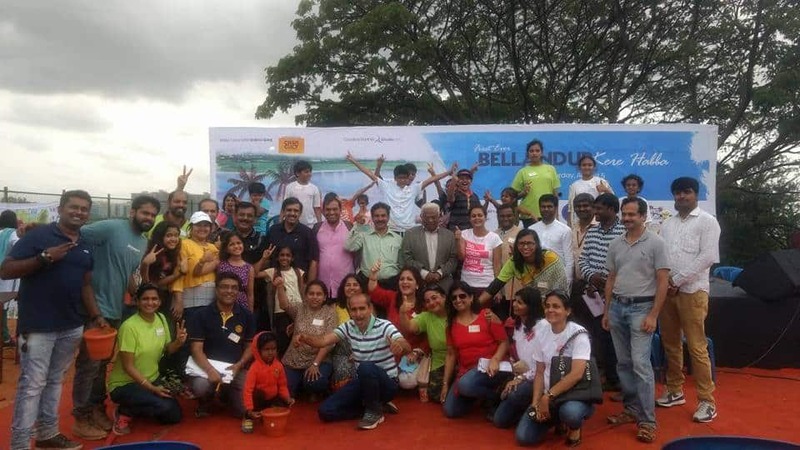 Bellandur Lake group took it on themselves to make it happen with whatever time and resources available. We got assurance from BDA, KLCDA and Bruhat Bengaluru Mahanagara Palike (BBMP) to provide full support. The lake group members started discussing on a dedicated WhatsApp group and started formalising the event. Some in disbelief and some in excitement… There is a saying that when you really dream with all passion, whole universe conspires to make it happen. Rotary Club came on board for the planned event, Radio Mirchi brought in additional excitement and fervour to motivate, and we started dreaming bigger and bigger. Communities and businesses around the lake came forward to pitch in with micro-contributions and help. Bellandur Kere Habba started taking shape with daily discussions, ground inspection, sponsorships and programs. Decathlon came forward to conduct cycling event, Art Matters for collaborative art. there was a Clay Ganesha workshop for children, Echo Academy brought in Nirvana and there was Zumba on the lake side. The BDA started levelling the ground. BBMP pitched in to ensure ground was cleared for the designated day. KSPCB and BDA provided all required help along with permissions in organising the event. All activities to connect with the lake, like Lake detective, lake photowalk with different moods (by Geek Ideas) and conditions of lake, run on lake road, lake issues explained by kids — left the crowd mesmerised and nostalgic about the lake and surrounding natural ecosystem. Yes, lake still has weeds, foam and smell, but after realising the value and potential of the place, the citizens are becoming more adamant to push the envelope even more to get things in order and rejuvenate the lake to breathe the life back. The lake will soon be an asset to the community as we stand up together, connect and collaborate to clean it up, just the way we saw the collaboration for Kere Habba. Though all officials BBMP Commissioner, BDA commissioner, KSPCB chairman, KLDCA CEO, BBMP JC SWM, blocked their calendar to connect with citizens for panel discussions, last minute CM city tour changed the schedules. But what a hopelessly optimist crowd we are! We outshined it with wonderful panel discussions of experts. The panelists included Dr. Yellapa Reddy (former Secretary, Department of Ecology & Environment,) Dr Vijay Kumar (MD Scalene & BBMP Expert Member), Sridhar Pabbisetty (Namma Bengaluru Foundation) Ram Prasad (Friends of Lakes), Naimatulla Khan (BDA), N Lakshman (KSPCB), JC Mahadevapura Dr. Vasanthi Amar (BBMP). The session helped the public understand the lake issues, the options available for rejuvenation, current status and the role of various stakeholders and bodies. It also made citizens understand it’s not only the responsibility of the government but citizens are equally responsible in safeguarding and rejuvenating our own lakes. Some of the specialists indicated that the lake could be completely revived in a span of three years with cooperation of all stakeholders. All guests planted sapling along the fencing of buffer zone to mark the rejuvenation celebration. The day, started with wonderful run along the lake, cycling by the lake, yoga, zumba, hustle bustle of food and other flea market shops selling eco-friendly items etc. Kids and adults all engaged equally with food, fun and lot of awareness about lake. Kids’ vision of the lake in form of art was breathtaking. We kept a tight vigil to make it a zero-waste event with no plastic bottles, no paper cups, no disposables at all. Proper colour-coded and labeled as per 2bin1bag guidelines bins were placed at the venue. Food vendors served food in steel, areca and leaf plates, water dispensers were placed all around to refill water bottles. Invitees were asked to bring napkins, water bottles and cloth bags. Stall organisers were given detailed zero-waste guidelines in advance. Even panellists on the stage were served water in steel tumblers and clay bottles. After long time, seeing stage without disposable water bottles really made us think that it’s possible to have an event without generating waste. Swachcha was engaged in managing waste to ensure that food waste is composted along with areca and leaf disposables and dry waste went to recycling. The signboards were rescued through #KillBills drive. No flower bouquets, no garlands for guests. Only our appreciation, love and respect! All speakers left their mark behind by planting a sapling. We have kept all signs printed to be used at next Kere Habba (Vigyana Habba- Science Festival) at Soul Kere on August 19th. We are looking to convert the ground zero to walking trail and nature park so all of us can closely watch our beloved Kere and monitor its health on daily basis. Sridhar Pabbisetty, CEO of Namma Bengaluru Foundation (NBF) said that citizens need to watch and guard their surroundings, without which lakes cannot survive. We are ready to participate and lead the way and demand officials and government to facilitate the cleaning of lake. We will work closely with all concerned departments to push for implementation of expert committee recommendations. While speeding up STP is the main priority, and creates dependency on other works like desilting and desludging, fencing the lake completely to stop dumping garbage, sewage and other wastes is equally important. Despite NGT notice, only partial de-weeding, encroachment removal and fencing has been done. We need to ensure that work speeds up so we don’t lose the lake. Foaming and fire needs to stop. Bellandur lake should become attraction of the town by showcasing transformation from the biggest lake to most Beautiful lake. Let’s all take a pledge together: We will all be vigilant, will not allow anyone to abuse our lakes and nature and help in any way to make the lakes and city look beautiful. We will dare to dream BIG. Kudos to our volunteers and rock star organizers! All about Agara-Bellandur SEZ ruling; How to get khata without bribing; BMTC says no to safety alarms on buses? In this edition: NGT orders demolition of encroachment on Bellandur wetlands, fines developers; Paying property tax for 2016-17 (updated); BMTC says no to safety alarms on buses? ; Getting khata without paying a bribe… all this and more! 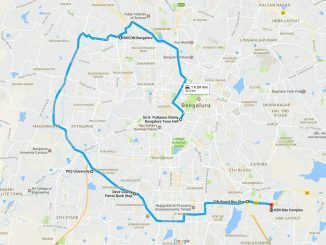 Here’s all the information that you need about Jaya Nagar ward prior to the BBMP elections: What has happened in the ward in the past five years, who is contesting, what are the problems?